Brent and Louise Harkerss have been working with the previous owners of South Pacific Safaris over the last two years and now have recently purchased their successful hunting business. South Pacific Safaris has provided International hunters with some of the best hunting to be had in New Zealand, harvesting world class trophies as seen in the photo gallery. Their exclusively owned property and lodge along with their free-range concession for Tahr and Chamois guarantees you a hunt of a life time. The hunting lodge offers luxury accommodation with fantastic views and is the only hunting lodge in New Zealand to be positioned looking out towards the Pacific Ocean and surrounding bush clad mountains. Imagine sitting out on the deck looking up to the hunting area and spotting magnificent trophies of Red Stag, Elk and Fallow deer and at the same time, looking out over the ocean at huge pods of dolphins! Brent and Louise are passionate about the quality of the trophies they provide to enable their clients to achieve their goals and enjoy their stay. Every Red Stag is different as is every hunter and we cater for all the different hunting methods, ie. Game Estate within our ranch, free range, on foot, or by use of the Helicopter for access and Wilderness hunts to remote areas. 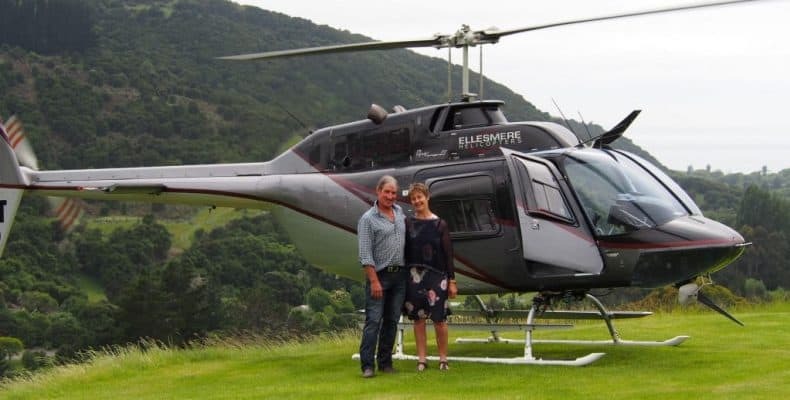 Brent and Louise have been married for 25 years and have bought up their 4 children enjoying the New Zealand lifestyle of outdoor activities including hunting, fishing, water sports, horse riding, rugby and skiing. Spending time with their family is important to them and they have done this while exploring the beautiful New Zealand countryside . They would now like to share this with their guests. Brent has always had a passion for hunting and the aviation business. He first became involved in the helicopter and deer industry over 30 years ago in the pioneering days of deer farming through live capture. He then went on to gain his commercial helicopter licence and has been operating a helicopter business since 2004. He is a member of the Safari Club International and the NZ Professional Hunters Guide Association. Brent will be guiding alongside Hayden who has been with South Pacific Safaris for 18 years and has always had a great rapport with hunters and is renowned for leading world class hunts on our estate.